Phoenix Root Canal Treatment| Peck Family Dentistry, P.C. Root canal treatment also known as endodontic treatment has a bad rap for being painful, however this does not have to be the case. When a tooth becomes infected or badly decayed a root canal is necessary. The infected tissue starts to swell from the antibodies and white blood cells that have traveled to the infected tooth to help fight the infection. 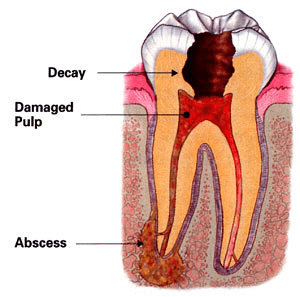 The tissue starts to deteriorate causing the tooth to abscess because there is nowhere for the swollen tissue to go. This chronic infection affects the tooth and its surrounding tissues. If you need root canal treatment, Dr. Peck prefers referring you to a specialist, called an endodontist, who can treat you with a high level of expertise and predictability. During treatment the nerve and pulp of the tooth are removed and the infection and inside of the tooth are thoroughly cleaned, removing all the necrotic tissue. The tooth is then filled with a special sealer to prevent the tooth from another infection. Due to this treatment the tooth becomes weakened because there is no more blood supply to the tooth, therefore Dr. Peck will most likely recommend a porcelain crown to protect the tooth structure from breakage. Many people worry about root canal treatment but, in practice, this is generally a relatively comfortable treatment. Local anesthetic will be used to make the tooth numb and, in the hands of a specialist, the procedure is rarely very lengthy. In many cases, the tissue inside the tooth is dead, which means there can be no feeling in the tooth. If there is any pain or discomfort following your treatment, call the office of the endodontist and they will be happy to help you.